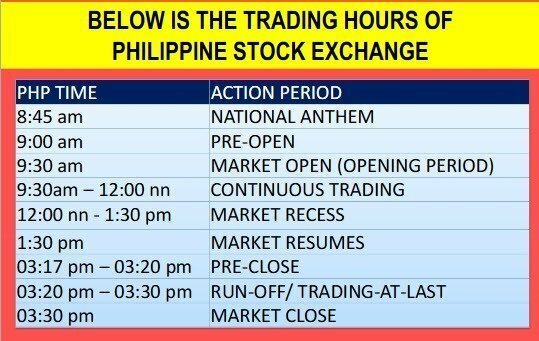 Philippine stock market, just like any other stock exchange, has scheduled opening and closing time. During this trading hours, you will be able to see the actual movement and fluctuation of stock prices of all the companies listed in the stock exchange that may help you in entering your real-time buy or sell orders. As with any other stock transaction-related information, better to check your broker on their specific policies regarding order entry timing and restrictions. COL Financial for example doesn’t allow modifications and/or cancellations of orders from 9:15am-9:30am (Market Pre-Open No-Cancel Period – order entry still allowed), while BPI Trade doesn’t allow order cancellation during the entire Market Pre-Open from 9:00: AM to 9:30: AM. What if the market is closed? Of course you can also put off-hour orders (or orders after the trading hours) to be posted in the exchange the next trading day. This feature is especially useful, for example, to employees who have no time to watch the market during the trading period coinciding with their work hours, or to our dear OFWs on the other side of the planet who would otherwise need to wake-up at the crack of dawn or late in the evening to place their orders. One disadvantage though with placing off-hour orders is that you’re only able to base your order price on the day’s closing prices, which is not necessarily going to be the opening price the next trading day. You miss the opportunity of monitoring the exact market hullabaloo to better adjust your investment decisions. In effect, you’re putting your orders predicting the market direction the next day, when you can actually have it right tuning to the market real-time. Check also the specific conditions and restrictions of your broker regarding posting orders after trading hours. May oil n gas ba dto ill buy stock . Can u sugest what esle are commoditities.